"'Cordon Bleu' is a French term, literally translated as 'blue ribbon'. The main dish for today's feast of Our Lady of Lourdes is Chicken Cordon Bleu and for dessert we will have Crepes with vanilla ice cream and blueberries. Heat the butter in a large skillet over medium-high heat, and cook the chicken until browned on all sides. Add the wine. Reduce heat to low, cover, and simmer for 30 minutes, until chicken is no longer pink and juices run clear. Heat a medium-sized skillet or crepe pan over medium heat. Grease pan with a small amount of butter or oil applied with a brush or paper towel. Using a serving spoon or small ladle, spoon about 3 tablespoons crepe batter into hot pan, tilting the pan so that bottom surface is evenly coated. Cook over medium heat, 1 to 2 minutes on a side, or until golden brown. Serve immediately. Top with vanilla ice cream and blueberries. Today we had our 7th annual Our Lady of Guadalupe fiesta with a few friends and our dear priest. (Here is a post I wrote from our party in 2006.) We started the day with Mass and then we all came over for lunch after wards. We had lots of Mexican food, but since it's Friday everything was meatless. I planned on making pina coladas and Mexican hot cocoa, but we are all so busy talking and eating that I forgot to make the drinks. I made rice and cheese and bean enchiladas, soft tacos, and we had lots chips and salsa. Adrianna made miniature strawberry cupcakes and put powdered sugar on them to make them look like roses. I also planned on making some Flan for dessert before Mass this morning, but the day got away from me. Here are a few pictures from today's beautiful celebration. Make a white cheese sauce with the butter, flour, cream and cheese. Coat the bottom of a baking dish with some Enchilada sauce. Spoon rice, beand and cheese sauce on the tortillas. Roll them up and place seam side down. Pour the rest of the enchilada sauce and cheese sauce over the tortillas and bake at 350 for 30 minutes. The cupcakes didn't last very long. The kids played The Scrambled States of America game. Our Lady of Guadalupe, Patroness of the America's, pray for us! Today the Church celebrates the Feast of the Immaculate Conception of Mary. The doctrine of the Immaculate Conception means that Mary herself was immaculately conceived without original sin. 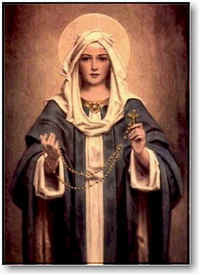 The idea is central to the belief in her absolute perfection and purity as the vessel of Christ's incarnation. She is the second Eve who will undo the trouble caused by the first one. She is part of God's plan for the redemption of humanity, and she was there from the beginning. Here are a few ideas for an all white menu symbolizing the purity and the stainlessness of Mary's immaculate soul. This was our dinner tonight. An especially appealing project for this Solemnity of Mary is to make a special candle. This candle can be made by attaching a picture or figure of the Infant Jesus to the base of a large pillar-type candle. You might carve a little niche for a tiny figure in the wax. The figure is then veiled (a piece of cloth fastened with pins) until Christmas Eve, when the veil is removed to reveal the Holy Child. On the Immaculate Conception, and every evening until Christmas Eve, have the children light "Mary's candle" when they say their prayers, and say the Hail Mary, or read with them her prayer, called the Magnificat (above). It would also be appropriate to have children place a rose before a picture or image of the Blessed Virgin Mary on this day. 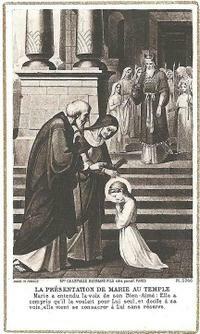 Read about The Presentation of the Blessed Virgin Mary from EWTN. 8. Those who are faithful to recite the Rosary shall have during their life and at their death the light of God and the plenititude of His graces; at the moment of death they shall participate in the merits of the saints in paradise. "And thy own soul a sword shall pierce, that, out of many hearts thoughts may be revealed." This is a picture of a craft the kids and I made last year for the feast of the Most Holy Name of Mary. I purchased the wooden letters form the craft store and we spay painted them gold and decorated them with ribbon and flowers. peace, and so let Eva be changed into an Ave of blessing for us. our evils, and ask all good things for us. born of thee, when born for us. forgiveness of our sins, and make us meek and chaste. united with thee in the blissful vision of Jesus. Ghost: to the Three one self-same praise. V. Hail Mary, full of grace, alleluia. R. The Lord is with thee, alleluia. V. Ave Maria, gratia plena, alleluia. Have a birthday cake decorated in blue. Blue is the traditional color of Mary’s mantle, so incorporating blue into the decor and food is quite appropriate. Decorate the family altar with flowers. Eat some blueberries– blueberry muffins, blueberry pancakes or blueberry pie. 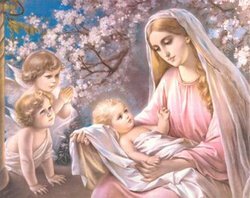 Pray the the Angelus, Litany of Loreto, Memorare and the Holy Rosary. 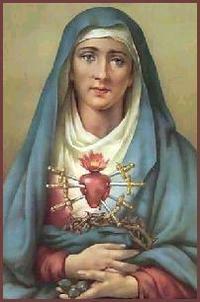 For those of us who attend the Traditional Mass, today is the feast of the Immaculate Heart of Mary. 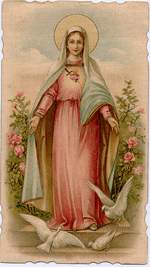 Here a a few prayers in honor of the Immaculate Heart.